May 19, 2012 - by Don - 15 Comments. In the past twelve months, I flew to Laoag, Masbate, Legaspi, Kuala Lumpur, Zamboanga and Cagayan De Oro. My favorite carrier of choice then was Air Phil because of their low fares. Unfortunately, this changed when my pop-up display booths were off-loaded when I took an Air Phil flight to Zamboanga last December 2011. This was allegedly what happened to the baggage of celebrity couple Claudine and Raymart Santiago at the NAIA, resulting in the Tulfo vs. Santiago brouhaha. What seemed to be educated, well-mannered citizens exhibited uncivilized, unbecoming attitudes at the airport. Claudine’s lashing at the ground personnel was totally normal and understandable in the context of their baggage being off-loaded and that the poor, traumatic experiences that Tulfo and the Santiagos received from the Cebu Pacific is the real cause of their unhappy arrival at Manila. When an airline off loads your baggage, they miss several essential key points. The first is that YOUR BAGS ARE AN EXTENSION OF YOUR PERSON. Notice how much time you spend in putting together your travel bag? You create a list, you shop for essentials, and you pack them properly. The contents of your bag are not just pieces of merchandise. They are an extension of you. Your clothes, your make-up, books, papers, they are all part of who you are. You value them. You spent hard earned money to buy them. And you expect that when you go places, these extensions of your self will be available to represent you. In other cases, BAGS ARE LITERAL EXTENSIONS OF LIFE. My baggage was a piece of equipment that is necessary to sell and do business. Some contain medicines that when not taken on time may lead to discomfort or even death. And when baggage are off loaded, it’s as if the airlines are saying we don’t care about your person or about your life. Second, when you surrender your baggage for check-in and pay whatever cost you have to pay to get it past the counter, there is an unwritten, but clear expectation that YOUR BAG WILL ARRIVE AT YOUR DESTINATION WITH YOU. Airlines may present you with legal fine prints written in the smallest font size at the back of your ticket that waives responsibility over this (which if exist may be both injustice and illegal) but this does not negate the fact that you expect. Why do you expect? Because you have paid for it. Is it normal for you to pay Aling Lita five pesos for a powdered juice, then just smile and leave if she does not give you the powdered juice? Is it normal for you to magpaload ng 30 pesos and just leave, bahala na kung maload-an ka or hindi? But even so, if in ten minutes, you haven’t received your load, what do you do? You go back and ask and demand. So why is it that airlines don’t get this simple truth? Demanding payment for a service is a contract. And we as their customers expect that they will deliver. Third, since our bags are an extension of ourselves and that by paying we expect that the airlines will bring these bags to where we are as we arrive, we then walk away from the counter trusting them to do so. We have in effect parted with some of the most important belongings we have and have given our full trust to the airlines that these belongings will be treated as expected. We trust them with our belongings in the same way we fully trust them to fly that machine and bring us safely to our destination. But, what do airlines do? Frequent flyers would tell you stories of bags ripped apart when received at the arrivals or properly marked fragile packs with broken items inside. It is common to have bags being thrown out of haste to finish loading. Again, when airlines do this, they are as if saying they do not care about you. Now, what to do with trusting if upon arrival, your bags are nowhere to be found? 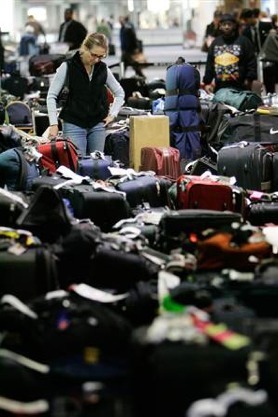 Finally, their idea of a solution: to bring in your bags at a later flight is not at all a solution. In fact, it is insult to injury. It means waiting somewhere near the airport (you cannot stay the whole afternoon at the arrival area. There are no seats in airports I’ve been in) for the flight to arrive. It means missing a day of what could have been a fun day or a productive business day. It means stopping your life and letting the airlines dictate what you do. Will they provide you with a decent waiting space or room while you are waiting? No. You have to shell out money on something which you don’t intend to spend on? Will they be willing to deliver your bags to your final destination, i.e. two municipalities from the airport town? No. They will expect you to go back in the afternoon to get your bags yourself. Waiting is expensive and time consuming. When airlines off-load, they disrespect your time and your resources. They say we do not care. Now the other day, a representative from an airline company said that there are many reasons why bags get off loaded from planes. She cited the weight of the plane, the weather conditions and another reason her brain was able to muster. But primarily she said it’s all about safety first. What she does not tell you is, it’s all about PROFIT first. You see ladies and gentlemen, and this is what I learned from the Zamboanga off-loading incident, we in the Philippines, do not have a cargo plane industry. Unlike in the US where carriers have planes designated for cargo only, here, our passenger planes act as cargo planes too. So not only are these guys loading the belly of the plane with your baggage but commercial cargo as well. That’s okay; we make do with what we have. But here’s the deal, air cargo hauling is expensive and thus more profitable on a per weight basis. So, when there’s a decision which to off-load, a Php 50,000 worth cargo or several bags covered by a promo, guess which gets off loaded? So bottom line, when airlines off load your bags, they are saying we prioritize first those that pay more and take care of the problem of small people later. They say “we do not care about your time, your belongings and the business that you may lose because of our policies.” At the end of the day, off-loading tells you that Philippine Airlines, Cebu Pacific Airlines, Air Phil Express and Zest Air DO NOT CARE ABOUT YOU. Anyway, what can we do, but gripe, get mad, cry and sometimes punch and kick someone in the face. Spinning the spin of the spinners. Previous Article I Love Jessica Sanchez!!! The positive side of the Philippines doing it this way is you can fly anywhere in the country for $25!!! Peter, were the $25 worth it? The reason I was really not surprised how Claudine acted. What if it wasn’t Claudine who scolded that lady at the counter? What if its just another ordinary commuter? I don’t even think it will get even the slightest media mileage. And I don’t think that lady would care enough. Too bad, she just got the ire of Claudine. People tend to look at the Baretto-Tulfo brouhaha, but the bigger issue here is how the local airline industry rips every paying customer by providing sucky services. At the end of the day, after all the apologizing, was the issue that started all of these resolved? Nah, I don’t think so. I’m flying again on the 23rd on a Cebu Pacific flight. I will be carrying with me a projector for a business meeting. The office booked a flight one day ahead of the meeting just in case. I have resolved not to check that projector in. It might not arrive with me or worse, arrive in more than one piece. We travel in the same manner. I don’t check in my projector. I bring with me the essentials to do business. When I was traveling in the US, the airport lost my baggage during a connecting flight. It happens. I’m certainly not defending the airport service, the local airports especially, as getting your luggage back is a major inconvenience. Still doesn’t excuse these people to start acting like a bunch of monkeys though. Is Get Real Post a simple collection of opinion stories or is it obliged to make a collective stand on an issue? It seems that this story is more sympathetic to Ms. Barretto’s situation as a customer entitled to commensurate service, which is a stark contrast to last week’s criticism of her dÃ©classÃ© pedigree and self-important fit. Please do not take offense in my query. @Christophe, GRP does not have a collective position. None of its writers are required to follow a prescribed position on any matter or take a politically-motivated stand on any issue. We are bound more by a shared approach to evaluating ideas and issues. ibang klase ang Cebu Pacific,benta sila ng benta ng ticket tapos magche-check in ka na nga lang ipapa-offload ka pa nila sa immigration. tapos sa immigration naman aside sa wala ng pangalan booth nila mga tao dun wala din mga ID kasi nga mga illegal ginagawa nila. ito pang malupit before ka pang-mainterview nakapagdecide na silang offloaded ka. mga bastos mga tao dyan sa terminal 3. masaya ang cebu pacific kasi kapag ini-offload ka nila babay na sa binayad mo na pera para sa flight na dika pinasakay tapos tatanggap ulit sila ng pasahero na sya ang uupo sa dapat na uupuan mo kung nakapasok ka sana. walang kwenta ang cebu pacific. at sa mga immigration officer dyan ang masasabi ko lang, umayos kayo kasi mga public servant kayo yung tinatanggap nyong sahod galing yan sa mga taxes na binabayaran namin monthly,quarterly at annually. ang kakapal nyo. Yah right mga bastos talagang mga immigration officer yan, ang kakapal ng mukha, ihohold ka then inteview, tpoz iiwan ka na lang ng parang wlang nagyari. Excuse me if not with our taxes wala kayo sa position nio, yes, youre just doing your job pero be fair nman, ang mahal kia ng ticket tpoz iooffload nio lang, purke bayad na kami sa ticket specially sa international flight wala nang pkiaalam sa amin ang cebu pacific..Asan ang customer service nio. @ Christophe, I don’t take offense in your query. Generally, I feel I don’t see any reason why Get Real Post would not come out with a collective stand on an issue. Heck, maybe GRP should come out with a collective stand against off-loading baggage. But the important thing is, different ways to look at an issue are presented. Some chose to comment on other’s behavior while I chose to put my ten cents worth on something else. Kudos! This is actually a fresh and analytical take on the issue. I understand the industry you are in, the client will not be considerate whatever reason you have for the delay. That would even be worse if the pop ups did not make it to the sheduled event on time. In a nutshell the author is simply saying that as long as the airline industry continue with this crappy service, we will not be the seeing last of these incidences where people, supposedly decent, blows their top and acts like neanderthals. I agree with this article 100%. How do you deal with inefficient workers who are tasked to serve the public? How do you deal with the 17 senator-judges who are showing to convict Corona without scrutinizing the evidence diligently? How do you deal with these 17 senators who already have a convict verdict even before hearing Corona speak before the court? As a collegial GRP body — what should we do? Ang masaklap pa dito, mayroong labor union ang Philippine Airlines na napaka-abusive at napaka-demanding sa kanilang administration. Do you think it accounts for the poor baggage service? Base ito sa sa interpretation ko mula sa mga naririnig ko sa news. Please correct me if I’m wrong na lang. Thank you.